Since 1957, a total of 33 conference volumes, monographs, and other collections of articles have been published on behalf of the EAAS. Hans-Jürgen Grabbe, General Editor on Behalf of the EAAS, Heidelberg: Universitätsverlag Winter, 2008– . New!.Download the 2016 flyer and order form. Web page.of the series. Tanrisever, Ahu. Fathers, Warriors, and Vigilantes: Post-Heroism and the US Cultural Imaginary in the Twenty-First Century, vol. 10, 2016 (Rob Kroes Publication Award 2015), xvi +273p., ISBN 978-3-8253-6578-3, € 39 (also as e-book). Order on line.. Reviews: Katerina Marazi, European Journal of American Studies [Online], Reviews 2016-4, document 9, online since 21 Dec. 2016, http://ejas.revues.org/11687. 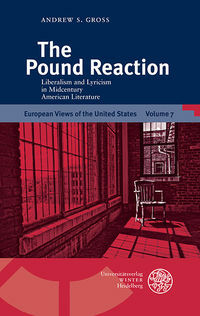 Gross, Andrew S. The Pound Reaction: Liberalism and Lyricism in Midcentury American. Literature, vol. 7, 2015 (Rob Kroes Publication Award 2013). viii + 262p., ISBN 978-3-8253-6470-0, € 36. Order on line (also as e-book). Reviews: Greg Barnhisel, Make It New 3.4 (2017): 90–92; Astrid Franke, Amerikastudien/American Studies 62.2 (2017), PDF, dgfa.de/wp-content/uploads/Franke_zu_Gross.pdf; Wit Pietrzak, European Journal of American Studies [Online], Reviews 2018-3, journals.openedition.org/ejas/13478; Johannes Voelz, Anglia 136.4 (2018): 768–71; Grzegorz Kość, Polish Journal for American Studies 10 (2016): 231–33; Radu Vancu, American, British, and Canadian Studies Journal 24 (2016): 150–56; "Brief Mention," American Literature 88.4 (2016): 871. .The H ealth of the Nation, eds..Meldan Tanrısal and Tanfer Emin Tunç, vol. 6, 2014 (Izmir Conference 2012). 266p., ISBN. 978-3-8253-6322-2, € 36. Order on line (also as e-book). Reviews: Ivan Čipkár, Moravian Journal of Literature and Film 5.2 (2015): 99–103. Frank Mehring, The Democratic Gap: Transcultural Confrontations of German Immigrants and the Promise of American Democracy, vol. 5, 2014 (Rob Kroes Publication Award Winner), xxiv, 403 p.,. 38 unpag. color plates, ISBN 978-3-8253-6170-9, € 50. Order on line (also e-book). .‘Forever Young’? The Changing Images of America, eds. Philip Coleman and Stephen Matterson, vol. 4, 2012 (Dublin Conference.2010). xiv, 271 p., ISBN 978-3-8253-5967-6, € 40..
Download the ordering form (pdf). E pluribus unum or E pluribus plura? Unity and Diversity in American Culture, eds. Hans-Jürgen Grabbe, David Mauk, and Ole Moen, vol. 3, 2011 (Oslo Conference 2008). x, 306 p., ISBN 978-3-8253-5857-0, € 40. Reviews: Susan Savage Lee, Journal of American Studies in Turkey 33-34 (2011): 104-06..Agnieszka Kotwasińska, Polish Journal for American Studies 6 (2012): 139–41; Gregory Jason Bell, Moravian Journal of Literature and Film 3.2 (Spring 2012): 89-95. Astrid Franke, Pursue the Illusion: Problems of Public Poetry in America, vol. 2, 2010 (Rob Kroes Publication Award Winner). xiv, 281 p.,. ISBN 978-8253-5751-1, € 39..
Conformism, Non-Conformism and Anti-Conformism in the Culture of the United States, eds. .Antonis Balasopoulos, Gesa Mackenthun, and Theodora Tsimpouki, vol. 1, 2008 (Nicosia Conference 2006). x, 330 p., ISBN 978-3-8253-5479-4, € 42. Reviews: Paulina Mackay, European Journal of American Studies, Reviews 2009, [Online], article 3, put online 25 Feb. 2009 <http://ejas.revues.org/document7514.html >; Jan Burda, Moravian Journal of Literature and Film 1,1 (2009): 116–17; Sascha Pöhlmann, Amerikastudien / American Studies 54, 3 (2009): 523–25; Tanfer Emin Tunç, Journal of American Studies of Turkey 27 (2009): 185–86, online at <http://www.ake.hacettepe.edu.tr/Install/JASTFiles/jast27.pdf>; Reference & Research Book News (Nov. 2009): 65; Thomas Austenfeld, American Literary Scholarship (2008): 474–75. Rob Kroes, General Editor, Amsterdam: Amerika Instituut, Uni­versiteit van Amsterdam, 1980–1988; VU University Press, 1990–2006. America in the Course of Human Events, eds. Josef Jařab, Marcel Arbeit, and Jenel Virden, vol. 63, 2006 (Prague Conference 2004). The Cultural Shuttle: The United States of/in Europe, eds. Véronique Béghain and Marc Chénetier, vol. 57, 2004 (Bordeaux Conference 2002). "Nature's Nation" Revisited: American Concepts of Nature from Wonder to Ecological Crisis, eds. Hans Bak and Walter W. Hölbling, vol. 49, 2003 (Graz Conference 2000). Reviewed by Hannes Bergthaller, Amerikastudien/American Studies 53.1 (2008): 123-26. Ceremonies and Spectacles: Performing American Culture, eds. Teresa Alves, Teresa Cid, and Heinz Ickstadt, vol. 44, 2000 (Lisbon Conference 1998). Living with America, 1946–1996, eds. Cristina Giorcelli and Rob Kroes, vol. 38, 1997 (Warsaw Conference 1996). The Insular Dream: Obsession and Resistance, ed. Kristiaan Versluys, vol. 35, 1995 (Luxembourg Conference 1994). The American Columbiad: "Discovering" America, Inventing the United States, eds. Mario Materassi and Maria Irene Ramalho de Sousa Santos, vol. 34, 1996 (Seville Conference 1992). Victorianism in the United States: Its Era and Its Legacy, eds. Steve Ickringill and Stephen Mills, vol. 24, 1992 (London Conference 1990). Looking Inward, Looking Outward: From the 1930s Through the 1940s, ed. Steve Ickringill, vol. 18, 1990 (Berlin Conference 1988). The Early Republic: The Making of a Nation – The Making of a Culture, eds. Steve Ickringill, Zoltan Abadi-Nagy, and Aladár Sarbu, vol. 14, 1988 (Budapest Conference 1986). Social Change and New Modes of Expression: The United States, 1910–1930, eds. Rob Kroes and Alessandro Portelli, vol. 10, 1986 (Rome Conference 1984). Impressions of a Gilded Age: The American Fin de Siècle, eds. Marc Chénetier and Rob Kroes, vol. 6, 1983(Paris Conference 1982). The American Identity: Fusion and Fragmentation, ed. Rob Kroes, vol. 3, 1980 (Amsterdam Conference 1980). Vistas of a Continent: Concepts of Nature in America, ed. on behalf of the European Association for American Studies by Teut Andreas Riese, Anglistische Forschungen 136, Heidelberg: Winter, 1979 (Heidelberg Conference 1976). Contagious Conflict: The Impact of American Dissent on European Life, ed. A. N. J. den Hollander, Leiden: Brill, 1973 (Geneva Conference 1972). Diverging Parallels: A Comparison of American and European Thought and Action, ed. A. N. J. den Hollander, Leiden: Brill, 1971 (Rome Conference 1967 and Brussels Conference 1970). The Role of Universities in the Modern World: A Transatlantic Dialogue, Bonn: Cultural Affairs and Educational Exchange Unit, United States Information Service, 1965 (Aarhus Conference 1965). “Special Issue European Association for American Studies,” The American Review: A Quarterly of American Affairs, publ. under the auspices of the European Center of American Studies of the Johns Hopkins Bologna Center, vol. 2, no. 4, March 1963 (Cambridge Conference 1962). Annual Conference of the European Association for American Studies, Berlin, 27–30 September 1961 [Berlin: EAAS, 1961] Eighteen typescripts of papers presented at the conference. Proceedings of the Second Conference of the European Association for American Studies Held at the Fondation des États-Unis, Paris September 3–6, 1957, Paris: European Association for American Studies, 1957 (Paris Conference 1957). * Books resulting from a EAAS Board decision to sponsor and finance.volumes containing essays produced by European scholars in languages other than English. The selected contributions were especially translated and published to give the authors a wider audience.